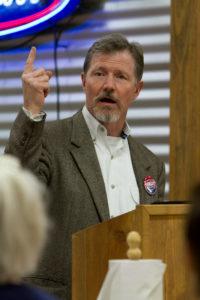 Moving the City of Kerrville in a positive direction by educating voters, influencing policy, and organizing action. Let’s fact check… Kerrville United does not take positions or create content about any partisan races or issues. This is a deliberate decision and something we take very seriously. All of our previous articles and videos are posted within this site, and you will not find anything about senate races, national politicians, or partisan politics. Our supporters are made up of folks from across the political spectrum — Republicans, Democrats, and Independents. City of Kerrville politics are non-partisan by nature. Because of the city’s charter, council members do not display party affiliation during campaigns or during their service. We believe that no single party has a monopoly on good ideas and no single party can face Kerrville’s challenges alone. We must all work together — across party lines — to make Kerrville a better place. We are disappointed that Commissioner Belew would use his radio program to attack our group with these unfounded claims. Further, we are disappointed that one of our county representatives would use his radio program to advance only one side of an important issue like the TIRZ and not allow a dissenting view, nor invite any experts that actually have answers to his questions about this project. We urge our readers to seek factual information and dismiss fear-mongering and charged rhetoric when deciding an issue. This entry was posted in City of Kerrville, Kerr County Commissioners, News on September 21, 2018 by Aaron Yates. Kerr County Courthouse. Copyright Aaron Yates. Commissioners will discuss adding weight limits to Split Rock Road in response to the gravel pit project announced by Martin Marietta. Respond to the City of Kerrville’s intent to annex the 195 acres owned by Martin Marietta that they intend to use as a gravel pit. Discuss and take several actions related to the Center Point wastewater project. Link to agenda and information packet. This entry was posted in Kerr County Commissioners, Local Issues and tagged commissioners court, kerr county, meeting on February 6, 2016 by Aaron Yates. Don’t just intend to vote; Make a plan!